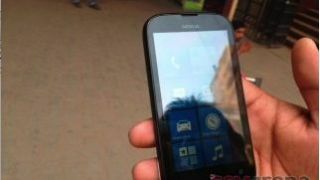 Nokia's budget-conscious Lumia 510 Windows Phone made a surprise appearance Wednesday in a newly leaked photo and alleged hardware specs. The update comes courtesy of GSMArena, which received an in the wild snapshot of the handset with just enough glare on the screen to make out the Nokia logo, buttons, and not much else. The source also provided a spec list, confirming the Lumia 510 will sport a 4-inch display, 4GB of internal memory, and 256MB of RAM. Prior reports have also indicated that it runs on an 800MHz Qualcomm Scorpion CPU and has a 5-megapixel rear camera. The specs certainly run on the lower end for smartphone hardware, with the source saying it will be priced accordingly at $150 without a contract. The leaked Lumia 510 specs are curious though, indicating that the handset will launch with Windows Phone 7.8 rather than Microsoft's newer mobile OS. When the Lumia 510 first leaked it was assumed that the smartphone would run on Windows Phone 8, since it would otherwise be rendered obsolete as soon as it launches. That is apparently a risk Nokia is willing to take, with the single-core processor and other hardware limitations holding it back from an upgrade. There is no word on a release date for the Lumia 510, which is expected to arrive first in China before wider global distribution. That is, assuming there will be a wider global distribution at all, which may be too little too late with Windows Phone 8 just around the corner.